As if any of these “shirtless” posts are off-topic! Wilhemina model Caleb Halstead shot by Matthew Scrivens for Armani Exchange‘s summer 2011 campaign. 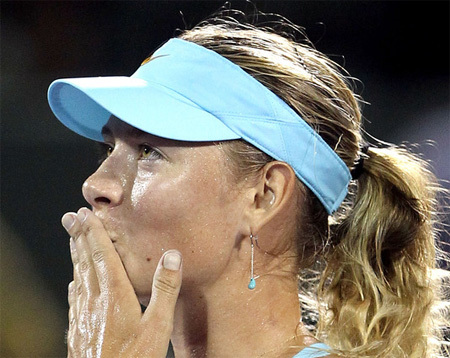 Maria Sharapova took over three hours to defeat 26th seed Alexandra Dulgheru 3-6, 7-6 (6), 7-6 (5) in the quarters of this week’s Sony Ericsson Open in Miami. Up next will be Andrea Petkovic, who’s already upset Caro Wozniacki and Jelena Jankovic on the way to the semis. And things don’t look good for Maria: Petko’s already beaten her once this year, at the fourth round in Melbourne. But who cares about Masha’s ugly stats — 17 double faults; twice as many unforced errors as Dulgheru — or that she rolled her ankle late in the third set? Take a look at those turquoise teardrop earrings from Tiffany! Matches her turquoise dress, of course. Buy: Elsa Peretti Teardrop earrings, $725, tiffany.com. Serena Williams came out to support her sister Venus‘ during her 2010 US Open run, including today’s semifinal battle against Kim Clijsters. Serena’s actually been around for a few rounds, bum foot (feet? sole? heel? face?) be damned. TSF was so distracted by doubles specialist Travis “Quick Hands” Rettenmaier that we forgot to show you the other half of that hitting session in New York: the Under Armoured Robby Ginepri. Blah blah blah Ginepri blah blah second round blah blah U.S. Open and Thailand Open blah blah first round blah blah Beijing. blah blah Shanghai, Moscow, and St. Petersburg. Here’s Feliciano Lopez at last night’s opening of a restaurant called Barroque in Madrid. what’s going on back there, janko? If Argentina and Andy Roddick had a love child, qualifier Leonardo Mayer would be it. The 22-year-old upset James Blake in the first round of the 2009 French Open with a 7-6 (6), 7-5, 6-2 win. Someone get him in touch with the Roland Garros barber and he’ll be golden. Scoreline: Leonardo will face Tommy Haas in the second round, and then the winner of the hotfest that is Simone Bolelli vs. Jeremy Chardy. The June issue of Vogue features a profile of Rafa Nadal accompanied by photos shot by Bruce Weber. The interview and shoot happened at this year’s Sony Ericsson Open in Miami. Travel: The man and his entourage are without a private jet. He flies commercial. More pics: View a short slideshow here. The full interview is available in the June issue of Vogue (with covergirl Cameron Diaz). It’s currently in newsstands. Efficent kid, this one. While he wasn’t using his Sharpie to amass players’ autographs, he used it for some good, old-fashioned huffing. Meanwhile, his dad sat in front of him totally engrossed in the competitive first set of the second-round match between Lleyton Hewitt and Fernando Gonzalez. Scoreline: Hewitt lost that match; Gonzalez has since lost — to Federer in the fourth round. It’s always fun to see the world’s role models patronizing tennis, isn’t it? The Office‘s Rainn Wilson was a few boxes away from TSF at the second-round match between Andy Roddick and Daniel Koellerer at this week’s BNP Paribas Open. That was the same night that Roger lost his doubles match. Mr. Wilson scurried out of Stadium 1 as soon as the umpire called the match (perhaps not wanting to get mobbed). He is taller than we expected. From Los Angeles, with love: We can’t share our (relatively) mild weather with the rest of the country, so we’ll do our best to distract you from that nasty nor’easter, nor’easterners! Enjoy these outtakes from Dmitry Tursunov‘s December pin-up shoot with photographer Corinne Dubreuil for the 2009 ATP Calendar. Clearly, all of Dmitry’s hard work pays off. FYI, Simone Bolelli got his left forearm marked up (to go along with another new tattoo and his long-standing “S“). Unconfirmed post at MTF says it’s his girlfriend’s name. Can anyone back it up? Scoreline: At this week’s Barclays Dubai Championships in Dubai, Simone lost in straight sets to Richard Gasquet in the second round. Tommy Robredo went through some spring cleaning on Friday morning, making good on a bet back in Argentina to shave his head if he won the Copa Telmex title. It all started back in Buenos Aires, when Tommy saw his friends Daniel Gimeno-Traver, Marcel Gronellers, and Alberto Montanes — all with buzz cuts. The world No. 15 said he would do the same if he won his finals match against Juan Monaco (and he did. Robredo traveled to Acapulco this week for the Abierto Mexicano Telcel hoping that his friends would have forgotten about this bet, but of course they didn’t let him off the hook; at the Fairmont Princess Hotel, Montanes’ coach Narcis Pelach styled Robredo’s hair as Santiago Ventura, Granollers, and Ruben Ramirez-Hidalgo looked on. In the quarters, Jose Acasuso snapped Robredo’s 12-match winning streak 7-5, 6-2. This was the fourth time in as many weeks that they’ve played each other (and are tied at 2-2). In the two weeks following the Novotnazation of Roger Federer at the Australian Open, much was said about men, sports, and crying. But little ink was spilled about Mirka, hand gestures, and screen caps. If Rafa‘s trying a new “adult” look to complement his matured tennis kit, like he did at this Liverpool vs. Real Madrid soccer match yesterday, can we offer our two cents? Buy a sports jacket that’s the right size. (I know volume is back, but, as Nick would say, those sleeves are ruffffffffffffffff). Follow that up with a trip to your tailor. You can ask your buddy Roger for some tips. He knows how it’s done! Or perhaps your buddies at Lanvin? …to the ground and give him a proper haircut. Scoreline: As the second seed at the Barclays Dubai Tennis Championships, Murray beat Arnaud Clement 6-2, 6-3 and will face Richard Gasquet in the quarters. Here’s a photo snapped at the semi between Rafael Nadal and Gael Monfils at the ABN AMRO tournament in Rotterdam. Nadal won 6-4, 6-4 but lost in the finals to Andy Murray. Who do you think was more in love with Rafa — the guy or his besty? Venus Williams applied an elaborate henna tatto for this week’s Barclays Dubai Tennis Championships party. It’s not the first time Venus has flirted with tattoos — remember the disappearing act of 2007? Scoreline: As she had wished before the beginning of this tournament, Venus will get to play against sister Serena in the Dubai semis. Venus took out Elena Dementieva 6-3, 6-3 while top-seeded Serena had no problem overcoming the go-for-broke strategy employed by Ana Ivanovic (Serena won 4 and 4). Browse: See the rest of our tattoo watch blotter here.